Reading has always played a really important role in my life. When I was younger, it was a tool to learn, a tool to imagine and a tool to get lost in worlds that people more brilliant than me constructed. As I’ve gotten older, I appreciate it for different reasons. At this stage of my life, I use books as tools to settle my very active mind. Working through the day, thinking through the day… I become unravelled pretty quickly if I’m being honest. For me, stepping away from devices and screens and spending 30-60 minutes on a break to read is like hitting a reset switch. I value it greatly. And my only real goal or resolution in 2019 that I spoke out loud was to make sure I read more. I also use reading as an important part of my bedtime routine. I take my health very seriously, and sleep plays a big role in that. For the last while, I have adopted a no screens in bed rule Monday through Friday. Sometimes on the weekend I’ll bring my iPad Pro to bed with me and get lost in a few shows or movies, but more often than not my devices are left downstairs on do not disturb mode, and I will read a book until I’m too tired to do so. In case you were wondering, I still prefer print books. I spend enough times with screens and I simply prefer paper and ink. Duma Key is a novel by Stephen King. I had never read a book by him despite having seen most of his works that have been reimagined on the screen, big or small. It was recommended by someone very close to me, and initially I found its length intimidating. However I was absolutely wrapped up in the story quickly, and swept away by the suspense that builds throughout. 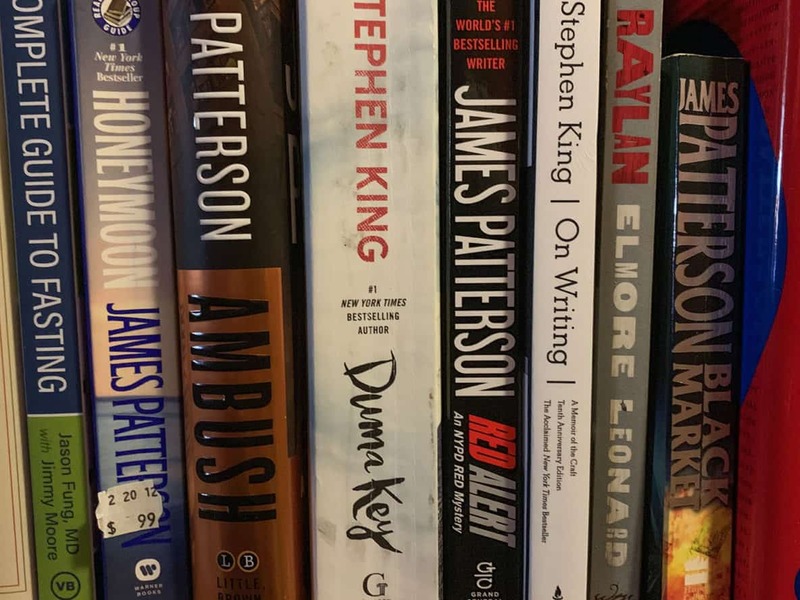 Although I have no basis for comparison where King is concerned, I would highly recommend Duma Key if you are a fan of his work (and haven’t yet read it) or a fan of suspense/horror novels in general. It is great story telling and character building, and it is the book that has set me down my recent path of learning to love fiction works again. Red Alert was my first James Patterson novel. It was an Amazon suggestion when purchasing another book and on a whim I added it to my cart. The NYPD Red concept was very appealing to me and the book didn’t disappoint. It is by no means a challenging read, but I thoroughly enjoy James Pattersons work because it makes for accessible quick reads. They are perfect books to travel with and read while laying poolside at your favourite resort, or on long commutes home etc. I blitzed through Red Alert and immediately went out and picked up two more James Patterson novels (used) to entertain myself. If you’re a fan of fast paced fiction and haven’t yet read any of James Pattersons novels (although based on historic sales figures, I may be the last person on the planet to have heard of him) I suggest you do so today. Reading Duma Key made me very curious about Stephen King and how he built such a prolific career. Over the years, a number of people and a number of podcasts have recommended another book he wrote called On Writing. This is Stephen Kings take on how to become a writer, and how he became a writer, and I can’t imagine there is anything else quite like it. It is wrapped into a beautiful life story and instead of step by step instructions, you slowly understand how his creative mind was formed. He shares countless stories of rejection and failure, and I found it truly inspiring. I credit On Writing with my current desire to write more, and it’s largely responsible for this blog resurfacing as of late. Whether you realize it or not, you’re probably familiar with Elmore Leonards work. I was very familiar with it when I purchased Raylan recently. I just finished reading it this morning and it was another tremendous effort. You may be familiar with the character Raylan Givens, as the FX show Justified is based off of him. If not, then you’ve likely seen one of the countless Elmore Leonard novels that has been turned into a movie, such as Jackie Brown, 3:10 to Yuma or Out of Sight. Raylan is not my first Leonard novel, and it certainly won’t be my last. I first heard about the book How to Break up With Your Phone by Catherine Price when I read this New York Times article. It’s a subject that had been on my mind a lot recently, and was something I was going increasingly concerned with, both where I was concerned and for society as a whole. This is an important work and forces us to re-examine our relationship with our phones and with our devices in general. How to Break up With Your Phone takes a realistic approach, as for most of us getting rid of the devices is simply not an option. If you have at all grown concerned with how and how much you use your cell, this book is for you. And if you aren’t concerned yet, you should be.